Don’t overwrite the Rproj file! In the HTML version of this book, you can also download the PDF version of the book by clicking on PDF button in the top toolbar of the page. HTML is the preferred format but the PDF format may be preferred for some readers. Links to the different GIFs directly found in the HTML version are provided in the PDF version. This resource is designed to assist students in CHEM 101/102 in using RStudio and R Markdown to complete their labs. (A more general reference to the specifics of R, RStudio and R Markdown is available in a different free book here (Ismay 2016)). This resource will show you GIFs explaining how to do some common procedures you’ll need to do to complete labs. In addition, it will provide more details about the specifics of the different lab templates available in the chemistr R package. Each chapter of this book will correspond to each of the different labs. Lastly, if you are interested, you’ll find instructions on how to complete the labs using RStudio Desktop instead of the RStudio Server in the Appendix. The Appendix will also include descriptions of the code that is sitting “behind the scenes” in many of the functions created in the chemistr package: chem_table, chem_scatter, chem_clustered.bar, etc. These functions were written to ease a beginner into working with R. Those interested in customizing their lab reports further should look over the R code in the Appendix. Additionally, many of the needed packages are automatically loaded when the chemistr package is loaded using library(chemistr). You’ll see how each of these packages is used in the Appendix. If further clarification is needed on any other aspect of the book, please email me with a reference to the error/area where more guidance is necessary. More advanced users are encouraged to create a GitHub issue here. Pull requests on GitHub for typos or improvements are also welcome and you can easily do so by clicking on the Edit button near Search at the top of the HTML version of the book. This book will evolve and be updated as needed based on feedback. You can always check the date at the end of the chapter to see when the book was last updated. It is recommended that you use Google Chrome as your browser since GIFs sometimes do not load automatically with other browsers. After logging in with your Reed College username (mine is cismay, for example) and password, you should see a layout similar to what follows. 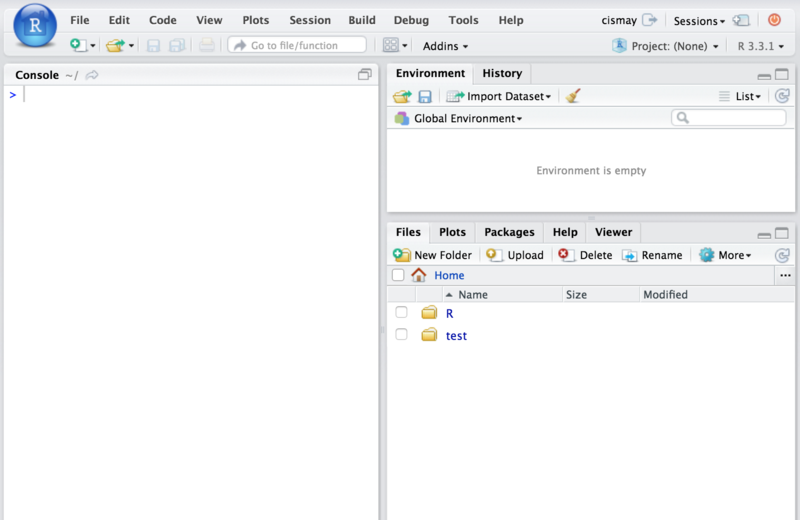 A good habit to get into whenever you start a new project following a common theme (such as your CHEM 101 labs) with R code is to create a new RStudio project to go along with it. RStudio project files have the extension .Rproj and store metadata that goes along with the documents you’ve saved and information about the R environment you are working in. 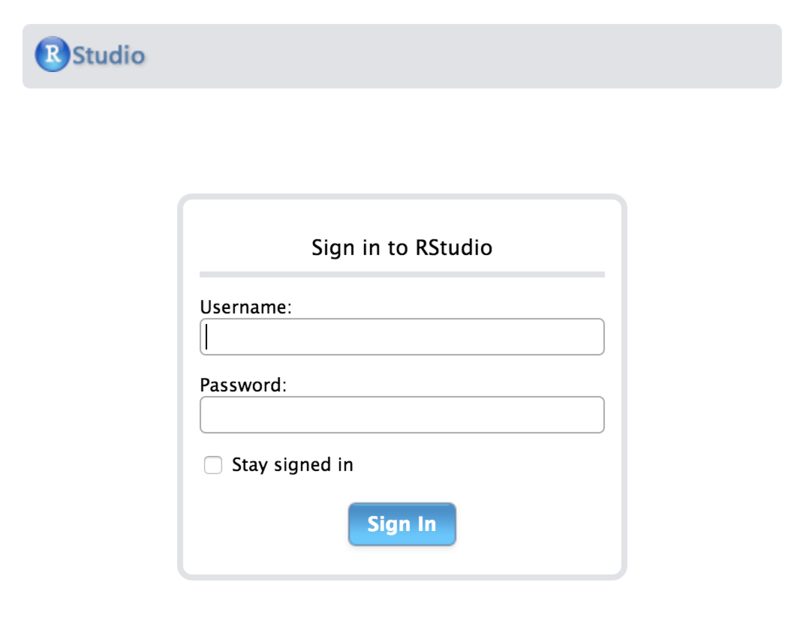 More information about RStudio projects is available from RStudio, Inc. here. You’ll be sharing your Chem 101 labs with your Danielle Cass (dcass) using the RStudio Server. This will allow Danielle to help you with errors you may be having in writing your lab report without having to email files back and forth. You’ll just need to email Danielle with the name of the lab you are having troubles with and what you named your RStudio project and she’ll be able to go in and look over your R Markdown file. You can think of this as working somewhat like Google Docs in that Danielle can provide feedback and walk-through your analyses. To share the project with us, you should follow along with the example below. Instead of naming your RStudio project CHEM101_ChesterIsmay as the GIF shows, you should name it CHEM101_YourName where YourName is replaced with your first and last names. Spaces can cause problems in file names so it is recommended that you avoid them. If you’ve already shared your project and you have spaces in the name, you’ll probably be OK, but try to avoid spaces in your file names going forward. Calling your project CHEM101_YourName will allow Danielle and I to track down your project more easily than if everyone named their project initial or something similar. You’ll need to also add cismay as someone you’d like to share the project with. You can do so by entering my username immediately after you have clicked Add to add Danielle or you can go back to Share Project and enter my name there just as you have with dcass. If you see that your project is shared with both dcass and cismay, you have completed this stage successfully. Important Note: There is a BIG difference between an Rmd (R Markdown) file that will store the code for each of your labs and this Rproj (RStudio Project) file. DO NOT OVERWRITE the Rproj file with your Rmd file or any other file. If you do this, Danielle and I will not be able to assist you since the Rproj file stores important information about sharing projects. You’ll need to create a new project all over from the beginning and it’s much better for everyone to not overwrite this file. Please create a new folder for each lab and LEAVE THIS Rproj file ALONE. It’s nearly impossible for Danielle and I to help you unless we know that you are having troubles. If you find yourself unable to complete a lab because of problems with RStudio and you’ve spent more than 30 minutes trying to figure it out, it is time for you to stop and ask for help. We encourage you to try to figure it out on your own as much as possible because this helps you learn, but if you are deeply entrenched in not getting R to work, that could be taking away from your learning of Chem 101/102 material. This tells us that you have tried to figure it out for yourself, but that you require our assistance. That is to be expected and you shouldn’t be discouraged if you don’t understand something about R Markdown immediately. We are here to help and please don’t give up on this. Learning how to work with R even at the most basic of levels will help you long-term in keeping track of analyses and getting you on the path to reproducible research. This will help you in your academic careers and whatever you do after your academic career ends. If you need assistance, please email Danielle with your concise error specifying in which lab and what the name of your RStudio project is. We are happy to help you learn how to use R! Additionally, it is extremely helpful for us if you can share a link to your RStudio Project in any emails requesting help. 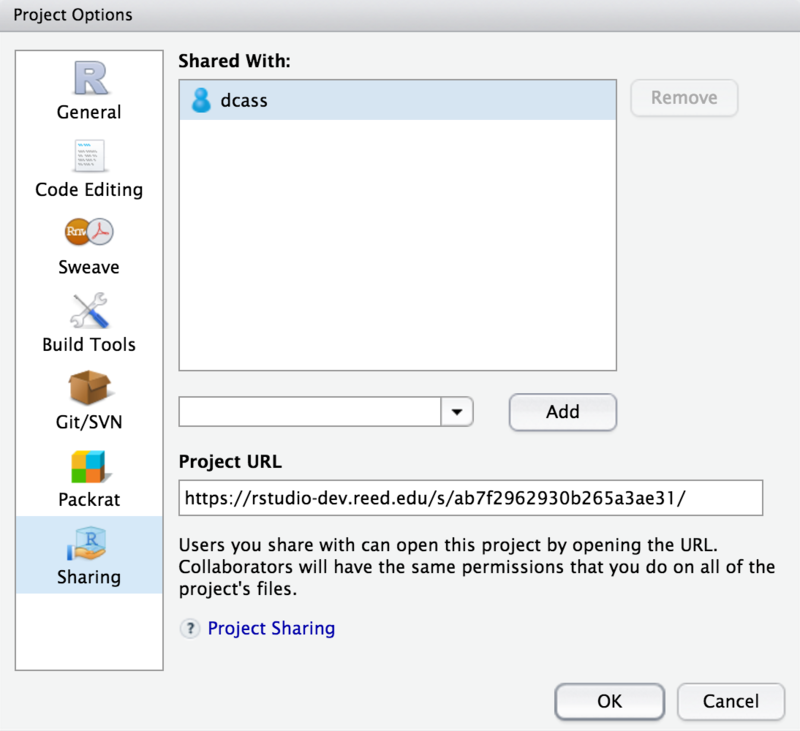 This link is available by going to your RStudio project in the top right corner of RStudio, clicking on it and then selecting Share Project, and then select Sharing as seen in the screenshots below. The link is given in the Project URL. Please copy this entire link into the body of your emails to Danielle or I so that we can quickly look into your errors. ##  "By travis on Wednesday, September 27, 2017 12:38:46 AM UTC"
Ismay, Chester. 2016. Getting Used to R, RStudio, and R Markdown. http://ismayc.github.io/rbasics-book.